Russian investigators have charged US investor Michael Calvey with large-scale fraud, in a case that has further strained ties between the two nations. Mr Calvey, the founder of the Baring Vostok investment fund, is suspected of embezzling 2.5bn roubles ($38m; £29m) from a Russian bank, Vostochny. Mr Calvey, who was held last week with five other suspects, denies this. 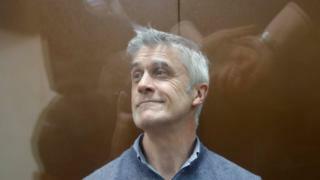 The US embassy in Moscow said Russia was denying US diplomats access to Mr Calvey, seven days after his arrest. "Under the bilateral consular convention, Russia is obliged to provide consular access within four days," the embassy said in a tweet (in Russian). "We insist on an immediate access," it added. Mr Calvey says that charges against him are being used as an instrument in a dispute among shareholders of Vostochny. In an unusual move, Russia's business ombudsman Boris Titov has questioned the legality of Mr Calvey's arrest. Meanwhile, several prominent Russian businessmen have warned that the high-profile case could raise concerns among foreign investors about the business climate in Russia. On Thursday, Russian Foreign Minister Sergei Lavrov admitted that Mr Calvey's case was "at the centre of rather lively political discussions". Relations between the US and Russia have been strained over a number of issues, including a major arms control treaty and Russia's occupation of Ukraine's Crimea peninsula in 2014.